Common health problems could be a thing of the past! 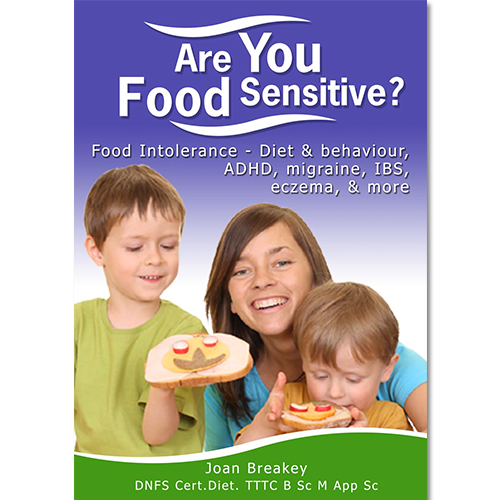 New revised edition of "Are You Food Sensitive?" Especially written for people who suspect they react to some foods and health professionals. “Are You Food Sensitive?” will teach you how to become your own Diet Detective. You’ll quickly discover what the problem foods and food chemicals are that you’re reacting to so you can significantly reduce or even eliminate your symptoms. Problems like: Eczema, Headaches & Migraine, ADHD, Irritability & Moodiness, Tummy aches, Irritable Bowel Syndrome and the related symptoms can often be linked to food sensitivity and diet. Food Sensitivity or Food intolerance is any adverse reaction your body has to foods or chemicals in foods. It is a real problem for many people. Reactions can include; Eczema, Headaches & Migraine, ASD, ADHD, Irritability, Tummy aches and Irritable Bowel Syndrome (IBS). If you or one of your Family Members have these conditions it is seriously worth investigating Food Sensitivity or Food Intolerance as a potential contributor. Are You Food Sensitive ? gives you a straight forward approach to doing this. It provides a proven method for being your own Diet Detective, giving you a simple, no fuss process for investigating which foods may be causing your health problems, saving you time and minimising impact on your lifestyle. People who saw a food-behaviour role in a child when young and wonder if diet could still have a role. Dietitians or similar health professionals wanting to understand the management of the whole diet investigation from first contact to having the patient manage their own diet Click here. The Diet Detective Method a unique and simple method of working out exactly what you react to. Each person has there own individual variation to what they react to. The book will teach you how to become your own Diet Detective, working out the group of food chemicals you react to. Learn about The Total Body Load. This is the concept that it is the total load of all suspect additives, food chemicals and also environmental chemicals, as well as family allergies which can have adverse effects. You will learn to lower all of these so you then gradually expand the diet as much as possible for the long term. Learn about Target Organ Sensitivity. Symptoms people get can range from ADHD to tummy aches or Irritable Bowel Syndrome, to eczema and other allergies. Catherine Saxelby, Dietitian and Consultant Nutritionist. Are You Food Sensitive ? has 11 chapters containing over 130 pages (A4). Take a positive step, today. Like many people, you may have been looking for answers to your symptoms for a long time. The information contained in Are You Food Sensitive ? has helped thousands of people. Get started on improving the your symptoms, download your copy now and get the answers. Purchase your copy of Are You Food Sensitive ? eBook and get access immediately. So “what’s an e-book ?”, you may be asking. Ebooks are the popular new way of publishing, purchasing and reading books. An eBook is simply a digital version of the traditional paper based book. E-books can be read on your Windows PC or laptop. As well as saving some trees (of course you can still print the e-book) being digital, you can download Are You Food Sensitive ? without the delay of postage and delivery costs. When you purchase an ebook you will be immediately sent an email “Your Food Intolerance Pro Order is Complete”, with a download link. Check your email after making a purchase. You can be downloading Fussy Baby in minutes, purchasing through our secure online payment process, using Visa, Mastercard or Pay Pal. Your order will be transmitted securely using the latest SSL Encryption signed by a 128-bit Thawte certificate. We are available to assist with any enquiry you may have at any time after your purchase. If you have an enquiry simply contact us. Click the “Purchase” button below to purchase Are You Food Sensitive?. Once you have completed the transaction you’ll be directed to a page where you can download your copy of the ebook. We’ll also email you all the purchase details for future reference. Click the “Purchase” button below to place the order for the hard copy of Are You Food Sensitive?. Once you have completed the transaction, you will receive an email with the order details. And once the payment is confirmed, your hard copy will be delivered to you in next 7 working days. Hard copies of all the books — Tolerating Troublesome Foods, Are You Food Sensitive?, Fussy Baby and the Dietitians Manual — is now $25 each. This includes postage within Australia. Discounts available on bulk order of hard copies of any books. Check out shopping cart to learn more about the available discounts. This includes postage and handling within Australia only. Fussy Baby written by specialist Food Sensitivity Dietitian Joan Breakey clarifies the introduction of solids and food sensitivity, and reveals new information about eating development and supersensitivity. Fussy Baby will help you understand why your baby may be struggling and provides practical recommendations that you can do put into place immediately and start seeing results. For more information click here. If you would like to know more about how food sensitivity could be effecting your baby, we recommend you purchase Fussy Baby . You can also take advantage of the discount rate for purchasing both books. Click the “Purchase” button below to purchase Fussy Baby . Once you have completed the transaction you’ll be directed to a page where you can download your copy of the ebook. We’ll also email you all the purchase details for future reference. Purchase both Fussy Baby & Are You Food Sensitive? and save. Click the “Purchase” button below to purchase. Once you have completed the transaction you’ll be directed to a page where you can download your copy of the ebook. We’ll also email you all the purchase details for future reference. You can print the e-book however we ask that you treat the material as you would a printed book, lending it family and friends but not reproducing it for wider distribution. The license allows the e-book to work on 1 computer at a time. You can easily transfer the licence to another computer whenever you wish.